Home / Unlabelled / Kodak Black Involves 50 Cent In The Game Beef: "You Were A Male Stripper"
During a live stream on his Instagram page, the Project Baby started singing along to "Hate It Or Love It" before calling out The Gameand proving that he doesn't care at all about what he said this weekend. 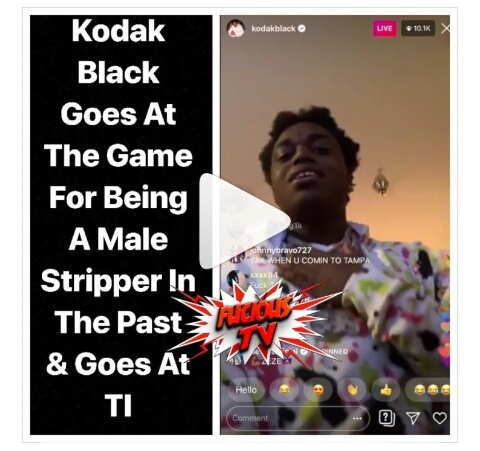 "50 [Cent] grabbed that boy off the pole," said Kodak in his video, referring to comments that Game's step-father made several years ago. "You was a booty shaker, you was a male stripper. 50 Centhad to come get you off the pole like whatchu talkin' bout. Yo, leave me alone. Stop talking about me. If Lauren ain't said nothing, y'all need to leave me alone."